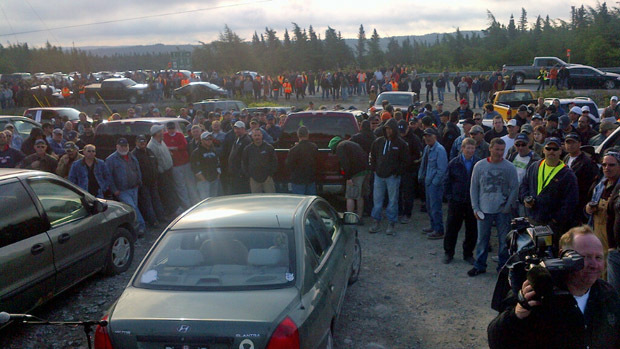 Up to 1,000 workers have gathered near the road to Vale's Long Harbour construction site in eastern Newfoundland this morning, as a wildcat labour dispute enters day five. Some employees have turned around, and many have joined in the protest, but there has also been a steady flow of traffic past pickets to the site. There was a rally-like atmosphere along the sides of the road to Long Harbour on Monday morning. Speakers addressed the crowd, composed mainly of workers who decided not to report to work on the site. 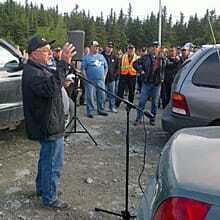 Electrician Kevin Slaney addresses workers gathered near the road to Long Harbour on Monday morning. (Adam Walsh/CBC)Portable toilets were erected at the location. Microphones have been set up for speakers to address the crowd. Some picketers were playing the guitar. The Long Harbour site generally has up to 2,000 employees a day working on it. According to the security guard at the gate, some people are working, but there is no count available as of yet. The illegal strike was triggered by about 100 crane operators last Thursday. Those now gathered near the Long Harbour road represent a number of unions. Vale was granted a court injunction last week preventing workers from blocking the road to the site. On Sunday, the umbrella organization representing all 16 trade unions at the Vale site urged wildcat strikers go back to work. Gus Doyle, president of the Resource Development Trades Council, said the unions do not support the illegal strike. "We have a collective agreement in place — they want the collective agreement to be opened up and changed, and that's not in the cards,” Doyle said Sunday. Long Harbour"I’ll just use my own kids as an example," he said. "I mean, a child will ask you something and they have an answer in mind, and if you don't give it to them, then you're wrong, and that's the case here today." Doyle insisted that Long Harbour would be open for business Monday. But workers have continued to express dissatisfaction with the company and their union representation. In an address to workers near the site Monday morning, electrician Kevin Slaney called for Doyle to resign. Workers are upset with wages and how the company is interpreting the collective agreement on issues such as travel and living allowances. Meanwhile, Labour Minister Terry French says he's very disappointed that many workers at the Vale construction site in Long Harbour continue to stay off the job. French says he cannot pick sides, but he's asked the the provincial justice department to review what action the government could take. The construction site is covered by a special work order, and under that legislation, strikes or lockouts are prohibited. The $3.6-billion Long Harbour plant will process nickel concentrate extracted from the Voisey’s Bay mine in Labrador. It's scheduled to open in 2013.